Set amidst majestic blue gum trees and picturesque vineyards, the beautiful Allesverloren bush chapel offers spectacular mountain views, excellent cuisine, award-winning wines and a charming reception venue. The 220m² reception hall can accommodate 200 guests with a dance area, or 250 guests without. Custom-made fine teak chairs and round tables covered with crisp white tablecloths ensure an air of elegance and sophistication. If you want to get married in the country somewhere simple, authentic and beautiful, Fynbos Estate should be at the top of your list. This stunning venue provides a flow of space for happy and relaxed celebrations while remaining committed to quality in every aspect of the event. There is a variety of lovely farm spaces to use – you can marry in the garden or old cellar, then have post-ceremony eats and drinks in the farmhouse gardens, before finally moving to the Pavilion, the Cellar or De Perdestal for your reception. And everywhere you look there are gardens, vineyards, olive groves and the beautiful backdrop of the mountain nature reserve. Het Vlock Casteel lends itself ideally to a variety of functions and offers a venue in the impressive castle-like building inspired by Cape Town Castle. The large, downstairs Alphonse Lavallee function hall seats up to 250 guests, and features impressive double doors that open onto the vineyards beyond. The high ceilings and large wrought iron chandeliers contribute to the feeling of a Medieval castle. The Castle is surrounded by vineyards and offers a splendid view of rolling hills and mountains while guests enjoy their pre-drinks and canapes on the deck. At Het Vlock Casteel, the natural stone walls, wood and iron finishes create a rustic atmosphere, while water features create a feeling of tranquillity. Situated in the Paardeberg, between Malmesbury and Wellington (75 km / 1 hour from Cape Town) the Kalmoesfontein venue on AA Badenhorst farm is an old house on a working wine farm, with a big open sinkdak back stoep. There is also a unique clearing in the eucalyptus forest where ceremonies can be celebrated under the maypole. Rustic to the core, this unique venue is ideal for bridal parties who want to enjoy an authentic, unfettered ambience. 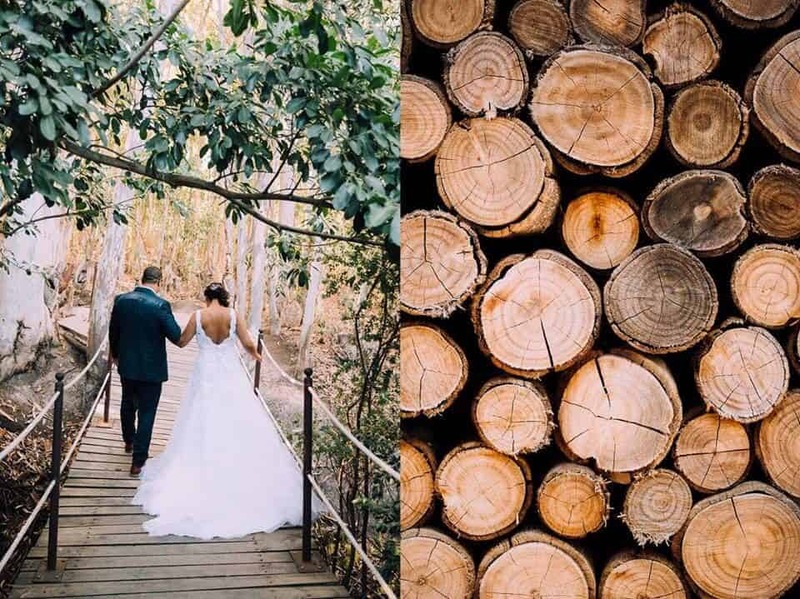 If you’re planning laid-back country wedding, Nieuwedrift Wine Estate offers a lovely restaurant set-up that can be adapted for smaller wedding parties. An ample stoep, rolling lawns and outdoor space that can be tailored to your liking set the scene for relaxed wedding celebrations. Org de Rac wine estate is an ideal setting for your special day. Choose from one of three rooms in the beautiful thatch-roof house, the wide veranda, or make use of the entire house with its water features and breath-taking views of the vineyards and wheat fields. The friendly staff at Org de Rac will welcome you and your guests and cater to your every need. The possibilities at this venue are endless and you can let your imagination run free − from an informal picnic in the beautiful indigenous garden, to a fancy black tie event. Stay on a Swartland wine farm during harvest season!